From the “That’s Not Recommended” category of forklift safety practices, we proudly present an incident that happened down under in Australia. According to an Australian Daily Mail article, a forklift driver became frustrated when a car was blocking the path of a delivery truck. 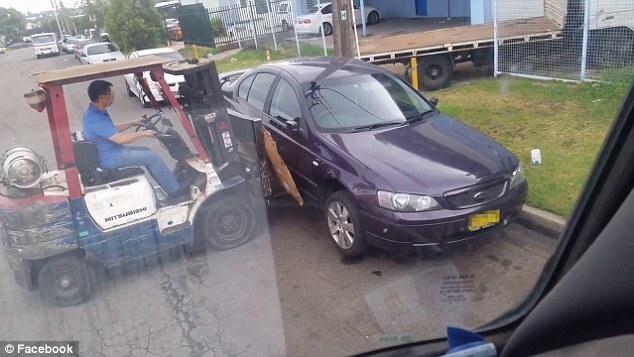 Instead of trying to contact the car owner (who was legally parked, by the way), the forklift driver simply scooped the car up, turned around and set the car down on the other side of the street. The “forklift-as-tow-truck” video has gained tons of exposure on social media outlets in Australia, the United Kingdom and here in the U.S. As you could imagine, Facebook comments have ranged from “Haha, that’s pretty funny,” to “Hope that guy gets fired.” And the weird thing is, the local police are investigating the situation and haven’t made any charges. Since the car wasn’t damaged, nobody was hurt and nothing bad came out of the whole affair, this lucky forklift driver may avoid criminal charges. At the very least, however, he’s probably looking at workplace safety violation fines or penalties from Australian version of OSHA. Thankfully, this crazy forklift story had a happy ending (well, maybe not for the driver, once he is most likely fined). Yet it very well could’ve turned out to be a disaster. Picking up cars with your forklifts isn’t something you’ll find in a CertifyMe.net forklift training class. We focus on smart, sound safety practices. Every one of our customers enjoys a 100% pass rate, as students can take the class online at their own pace. To speak with our OSHA forklift training experts, call us at (888) 699-4800. We’d love to get you started today. Plus, you can check out the CM contact page. Thanks again for reading the Certify Me blog. And remember, if a car is blocking your path, step away from the forklift and call a tow truck!